Besides juggling in Bryant Park (http://azuleteats.blogspot.com/2012/08/juggling-and-summer.html), my other favorite activity is ice skating. One of the perks is that admission is entirely free if you bring your own skates and a lock (just leave all bags at home since the lockers are rather small). Before the holidays, the rink plays assorted swing and jazz which fits the midtown scene very well. Around the holidays they start playing jolly tunes. And also be sure to check out all the holiday stores nearby. Post holidays they have assorted music, including DJ nights featuring theme music from local radio stations. (Maybe next year NASH FM will also be featured?) And then I read that they play movies?! At first I was skeptical of the rink side movie idea. After all, Feb is typically a cold month. Then I heard they were playing Grease, so I just had to check it out! Grease Lightning, easily one of the most fun dance scenes. At my high school everyone always danced and sang to Grease medley (summer nights/grease lightning, you're the one I want, we go together). The ice skating rink crew clearly needs to learn the dances and do a better job leading the crowd. 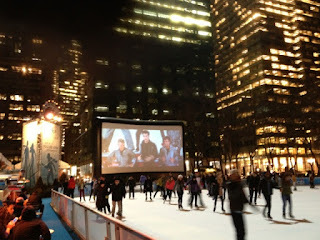 It was a bit distracting to try to watch the movie and skate. 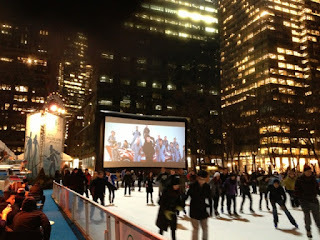 Luckily I've seen the movie many times so it was good to skate to the musical numbers. You can also snag a rink side seat and watch (but skating was much warmer) or try the rink side lounge area which is enclosed. The crowd is not quite as crazy as the summer movie series. Definitely files under 'only in NY', unless other cities also have winter ice skating movie festivals?